If only two major reference points exist for Pacific Rim to riff on, Neon Genesis Evangelion is one of them, and that's why it's standing at #2 on our list. 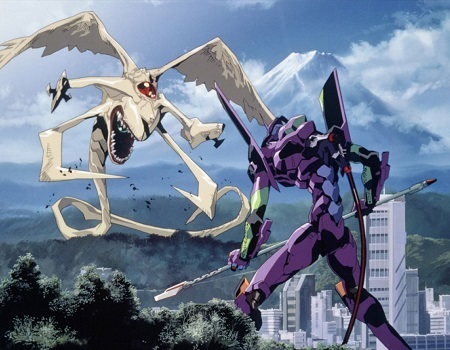 Like Genesis of Aquarion, Neon Genesis Evangelion - by far the more influential of the two - depicts a world under siege by a monstrous alien race known as Angels. The planet's survival rest on the shoulders of Shinji, a fourteen year old boy tasked by his military father to fight the angels by piloting a gigantic cyborg called an Evangelion. What happens when you put that weight on a teenager? Neon Genesis Evangelion primarily concerns itself with the psychological toll controlling a war machine takes; the show inherently understands that the excitement of watching Evas battle Angels is intensified the more that viewers care about the human characters. Don't let the occasional screwball gag fool you into thinking that this is light-hearted fare; the further that the series progresses, the darker it becomes.